The introduction of any new services into an old building demands skill and sensitivity. Considerable ingenuity is required to conceal pipe and cable runs to avoid damaging plaster cornices and skirtings, whilst allowing for regular maintenance and access if something does go wrong. Carefully chosen positions for service entry points, soil vent pipes, over-flows and internal fittings such as smoke detectors, radiators and electrical sockets can make all the difference to the visual success of a project. In old buildings this is usually best worked out on site in collaboration with the builder or contractor. Time and care should be taken in choosing new light fittings, electrical switches and sockets. In the absence of any original light fittings, which could be repaired or matched, these can be either reproduction or modern. Both types can be appropriate, although many off the shelf ‘period’ fittings are poorly designed. Well made, authentic reproductions are available, but they can be expensive and in many cases, small, discreet modern lights will be more sympathetic to an interior than ornate reproductions. It is possible to adapt brass ‘dolly’ light switches to modern standards when re-wiring but generally sockets should be replaced and simple, plain fittings are to be preferred. 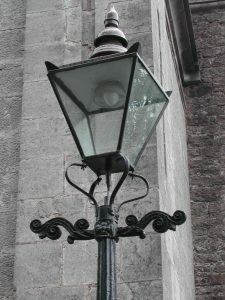 Indirect, diffused lighting is often kinder to old interiors, and early houses which did not have gas or electric lighting may be best respected by using table lamps. Wall lights can avoid damaging delicate or decorated ceilings. Installing central heating into historic buildings can create problems; drying out timber which leads to panelling and doors warping and causing excessive moisture to be drawn through walls. The absorption and evaporation of water in and out of an old building is generally in a state of balance, this is what is meant by a building ‘breathing’. Introducing a new system can upset this equilibrium and central heating should always be used sparingly at first to allow the building to slowly warm up and readjust itself. If extensive restoration is being undertaken, an under floor heating system may be the solution for an early building where radiators would not be appropriate. Second-hand or new cast iron column radiators suit later buildings and decorative radiator cases can be used to advantage. Thatched buildings must be kept dry all year round and a system of background heating, such as storage radiators should be considered if the building is only used sporadically. Satellite dishes are totally out of place on historic buildings and indeed putting a dish on a listed building requires Listed Building Consent. Television aerials should be positioned in attics. It is traditional, through expediency rather than design, to run the electricity supply into a building along the eaves, but in general the common tangle of wires, especially in urban areas, bringing services into a building can mar its appearance and all efforts should be made with NIE and BT to have the cables put underground. The introduction of complex security systems into historic buildings and compliance with Building Control regulations regarding fire safety and means of escape will often pose difficult problems. Conditions on the Building Control Approval can be amended or waived in certain circumstances and it is always sensible to discuss these issues on site with the official concerned. Most requirements can be met with willingness and imagination. How to look after your historic building? Heritage Angel Awards NI 2019. Now Open for Entries! Support the conservation, restoration and re-use of Ulster's built heritage. Ulster Architectural Heritage is the trading name of The Ulster Architectural Heritage Society NI Charity Commission No: NIC101510 | Company Reg No. NI 35582 Registered office, as above.